SPECIAL PROMOTION INCLUDES FULL SIZE URN For only $84. 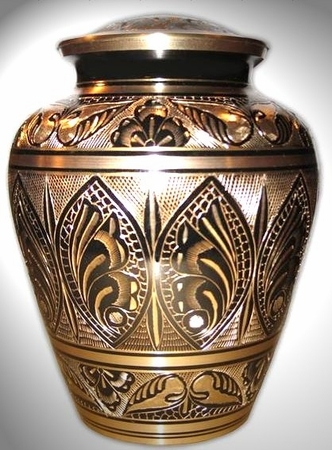 The Regal Brass is a beautiful full size premium brass cremation urn that is slightly shorter than other brass urns so it will fit in most columbarium niches. It has an intricate carved gold pattern over a black surface. The intricacy and visual complexity make it the one of the most beautiful brass urns on the internet or from any source. If you want an engraved nameplate put your wording for the engraved nameplate in the "comments" section of checkout. You can also just call us with your order - there is no difference in price for calling in your order (800) 594-8022.